Book your cooking kit for your use of the table. 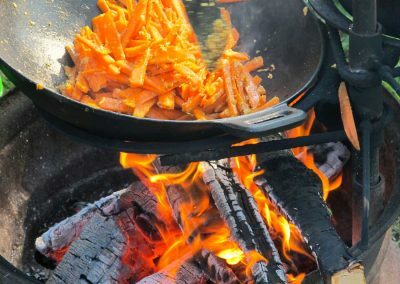 If you have booked your place at the open table through Visit Sweden, you can add your cooking kit and other experiences here! When you book the cooking kit, we will make sure that all utilities that you need for cooking and eating is prepared for you in the forest at arrival. 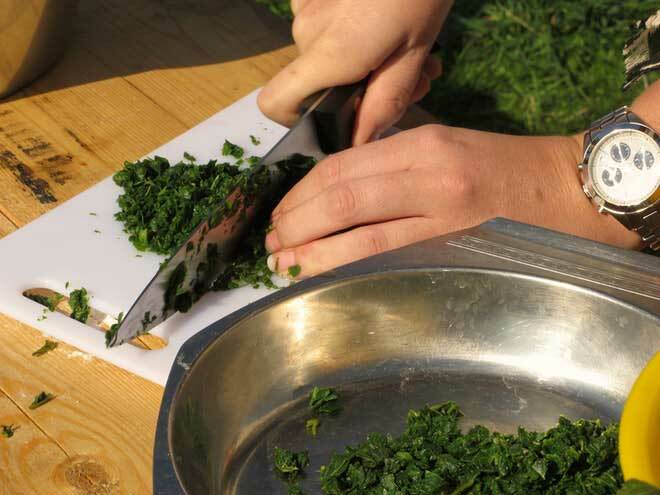 With the cooking kit, you’ll also get an overview over the plants used in the dishes, in order to lead you a bit to a safer “picking stroll” of plants. 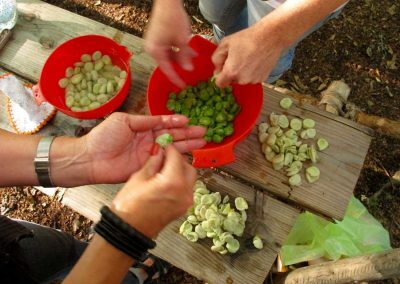 But note that you still work by yourself, bringing the ingredients you need, picking plants and cooking by yourself in the forest. 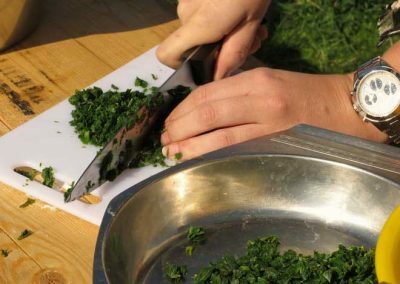 If you feel unsure about how to prepare for the cooking, what ingredients that you need, how to pick and harvest safely, how to manage the cooking stations – or just want an extended experience of Sweden and Swedish nature, you can also add several other extras to your experience. 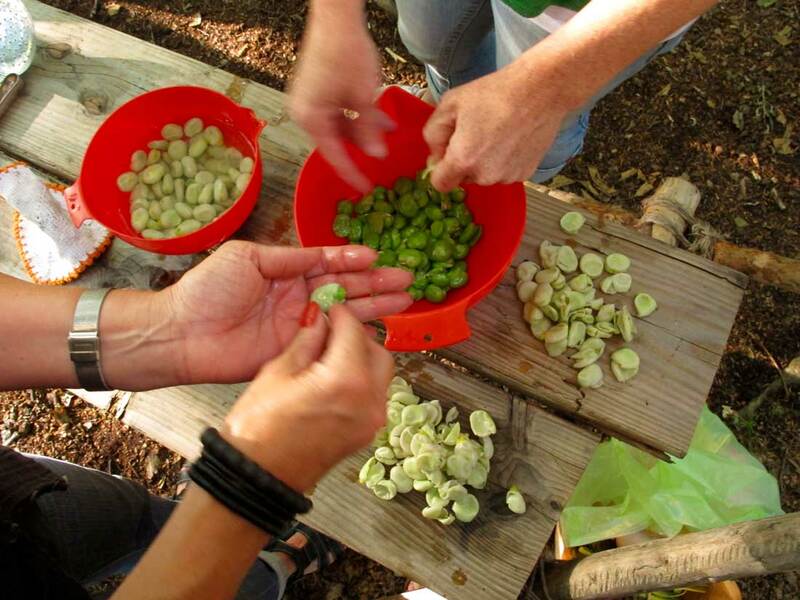 A. a small guided safari tour to pick ingredients for your own cooking of the recepie – we’ll follow you out in the forest and to the meadow bringing back the plants that you need. If you book this activity, we’ll also send you a shopping list what you need to bring from a store in order to cook your meal fully. You can add this extra to all the other extras here, or just this add on alone. B. ingredients – If you not want to pick the plants yourself or shop ingredients by yourself at all, or just want a snek peak of the plants in the wild, we provide you with all ingredients that you need. They will be displayed in the outdoor kitchen when you arrive. You can book this extra together with C and D below or just this add on alone. C. a local cooking guide to extend your experience. 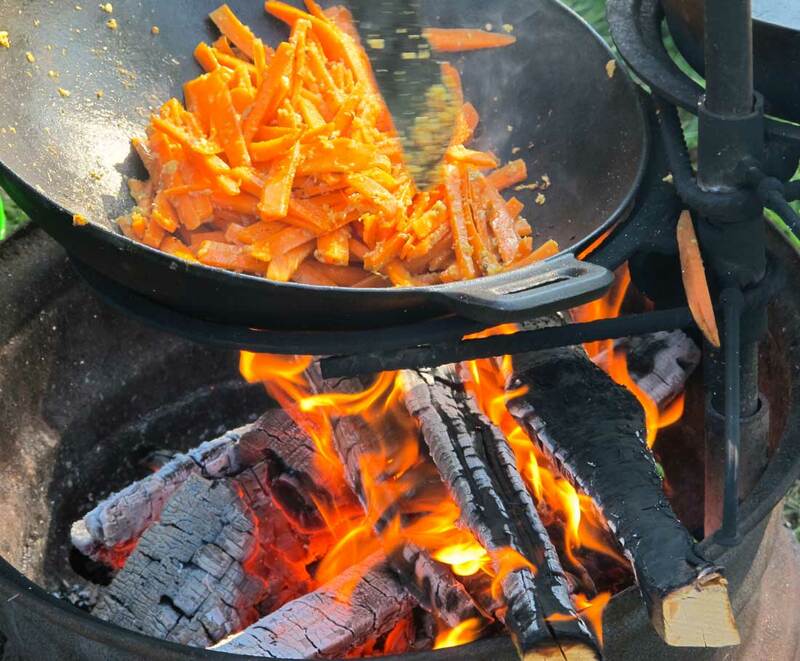 If you want a guide to join you, explain and lead you through the cooking session – and if you want to use our fires in the kitchen instead for the gas solution in the cooking kit, add a local cooking guide here. You can add this extra to all the other extras here, or just this add on alone – but note that if you only add this extra (C), you need to bring and pick ingredients by yourself. The guide will then arrive around 13.00 to start the cooking session. D. if you want to prolong your stay and sleep under the stars in the forest, we’ll put up a tipi or tent (or a mixture) for you to sleep in. If you book this extended stay, you’ll use our sleeping bags and small camping beds, and we’ll provide you also with a dinner (two courses) and breakfast kit it for cooking over the fires. Note that we don’t have any electricity or running water at this small forest stay, you pee behind a bush and use our compost toilet for number two. We provide you with water and logs for the fire, and of course, necessary instructions and safety rules and solutions. You can add this extra to all the other extras here, or just this add on alone. 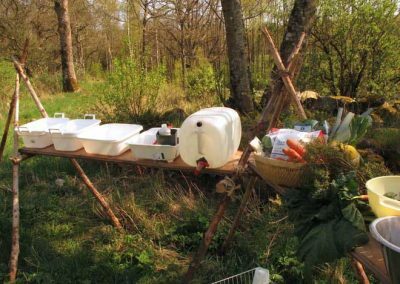 The cooking kit includes all utilities that you need to cook the menu in “The edible country” and to eat your lunch in the forest. Note that you still will need to bring and pick the ingredients and cook your meal all by yourself if you don’t add that as an extra here (see above A-D). When you book “cooking kit” you still have to bring and pick your own ingredients and also to cook your lunch all by yourself. You can add a small guided safari tour for picking ingredients, ingridients prepared in the forest, a local cooking guide for the cooking session or a prolonged stay under the stars (look at A-D above). You need to be prepared for an outdoor stay, remeber to check the weather report and adjust your clothes after the report. To arrive to the table (and to pick your ingredients) you have to walk in the nature, so be prepared with good shoes and outdoor clothes!